After shooting Reefer Madness, I stayed on in Canada to shoot a small role in Eighteen, a film written and directed by Richard Bell, who I'd first met when I was shooting Josie and the Pussycats in Vancouver in 2000. Eighteen is Richard's first feature-length movie, and is about a young boy of 18, Pip (played by the wonderful Paul Anthony), who is given for his birthday a tape from his dead grandfather telling him what his grandfather went through in when he was 18. The film flashes between the present and the trenches of World War Two. 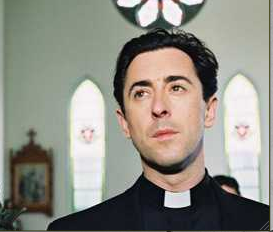 I play Father Chris, a priest who befriends Pip.